Here in the United States, we have a range of tree boring insects who target our trees. Around 20 years ago, the Asian Longhorn was added to this list. Unlike native boring beetles, this species seems more diverse and adaptable. They will readily attack a range of trees including maples, birches, poplars and willows. The good news is they don’t travel quickly. In fact its most likely this beetle is widening its range by being transported by landscapers and log distribution routes. And though first discovered in New York, their range is now coast to coast which proves the transport and distribution of wood products throughout our country is thorough. In fact every state has reported activity of this beetle so they’re effectively having an impact most anywhere. 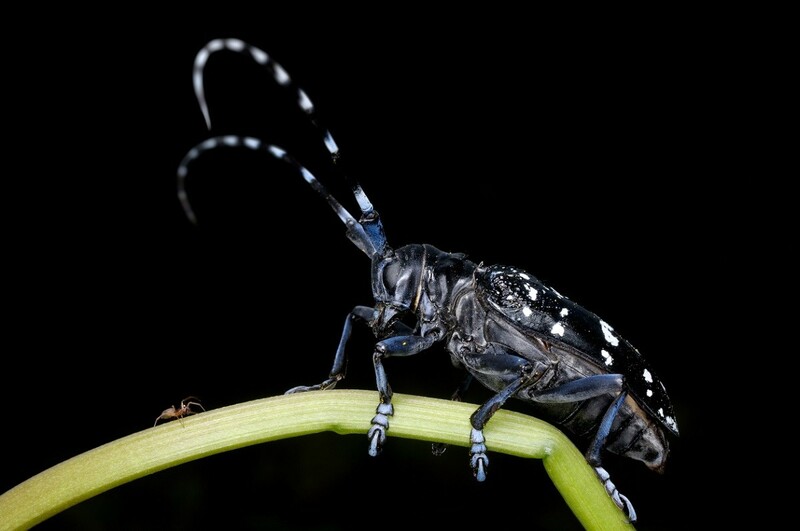 Asian Longhorn Beetles range in size from 1 to 1.5 inches. Adults will lay eggs on host trees which hatch larvae that feed on the trees bark and trunk. As they feed, the larvae will bore deep into the tree targeting the heart of the trunk. Though the feeding of the small larvae can be managed by most host trees, the holes created in the process can be devastating to the trees overall health. Larvae will typically feed 1-3 months and then pupate before emerging as adults. When they hatch, they’ll drill their way back out leaving large holes 3/8″ to 1/2″ in diameter. These holes will seep sap, invite other insects to nest and allow fungus and disease to develop. If you have Asian Longhorn Beetles feeding on your tree, there are three treatments available. In some case, all three should be done. For long term control and protection for trees both showing activity and trees not yet infested, systemically treating is both easy and long lasting. In general, one treatment will provide a full year of protection. But since this approach takes time to distribute through the trees trunk and limbs, spraying these areas directly is also suggested to keep them off trees during their active season. Lastly, since this beetle likes to bore under the bark, liquid spraying will sometimes not penetrate where they’re active so injecting with an aerosol can be the best approach for treating exit holes and behind certain barks on trees which typically grow layers. The first option that works well on this beetle is to drench the soil around the affected trees drip line with DOMINION 2L. Use .1 to .2 oz per inch of tree trunk width. Mix up to 2.5 oz per 4-5 gallons of water and apply the mixture to holes you make in the soil around the trunk of the tree inside the drip line. These holes in the ground can be made with a pick axe or any thin pipe like a 1/2″ piece of rebar. The holes should be large enough to contain the mixture as you pour it from your pail into the ground. In general, use 5-10 holes per 4-5 gallons of mixed solution. Dominion should be applied once a year to infested trees but you can also drench nearby trees to ensure they don’t develop the problem too. Keep in mind this treatment will protect the tree from all kinds of boring pests as well as foliage eating insects like caterpillar, aphids and whiteflies too. 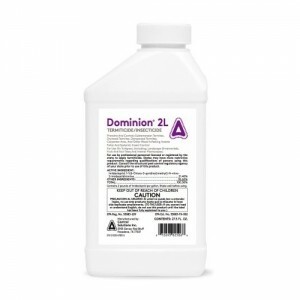 Dominion will take 3-6 weeks to “grow” into the tree so for immediate relief and to protect other trees from getting infested, spray CYPERMETHRIN at the rate of 2 oz per gallon. 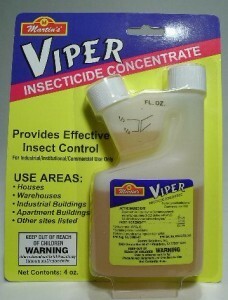 This active is highly repellent to boring pests and treatments can last 2-3 months. For this reason its a good exterior spray for all the limbs and trunks of any tree Asian Longhorns might target. Trees sprayed on a regular basis will be repelling this borer along with many other pests which can help to stave off a range of related problems. Use a good PUMP SPRAYER to make the application and make sure you spray at least 15 feet up. 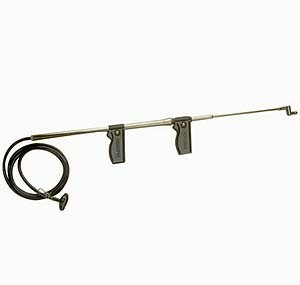 If you need to reach heights above 20 feet, the TROMBONE SPRAYER is completely portable and spray up over 30 feet. Since emerging adults are looking for mates and place to lay eggs, infested trees are prime locations they’ll use. Inspect the bark of you trees to see if adults are roosting behind layered bark. Certain species like pine trees will have plenty of gaps and crevices for adults to hide and the liquid treatments will often times miss key spots. To ensure these aren’t harboring borers, spray with FS MP AEROSOL. 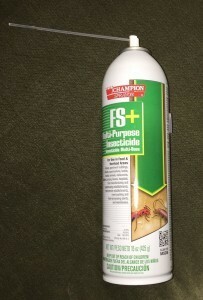 This oil based spray is fast acting and penetrating so its good to inject any holes you find too. 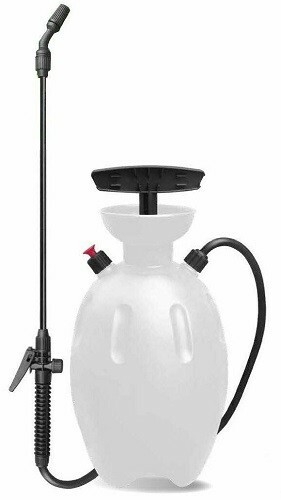 Spot treat as needed throughout the season and if you find any “pockets” of borers when spraying, you may want to do another liquid treatment with Cypermethrin.